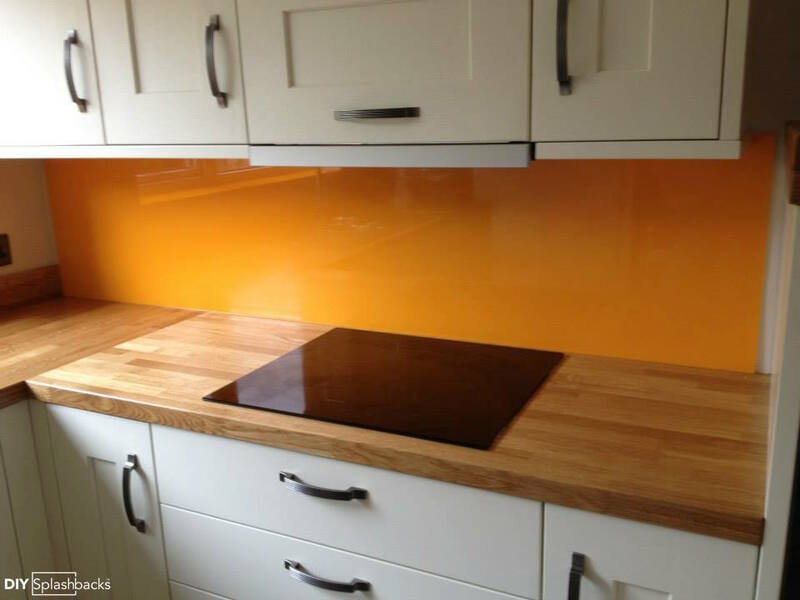 Orange and Yellow Glass Splashbacks. Orange is one of the hottest colours for 2016 with a glimpse back to the 1960s & 70s a big trend this year. 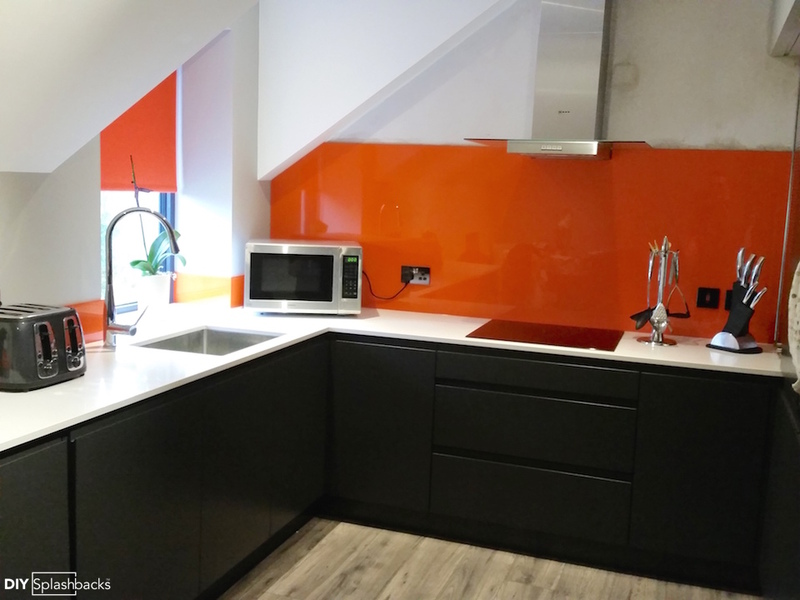 Orange glass splashbacks are a bright way to add colour to a scheme, with hundreds of shade variations you’re sure to find the right one for you. 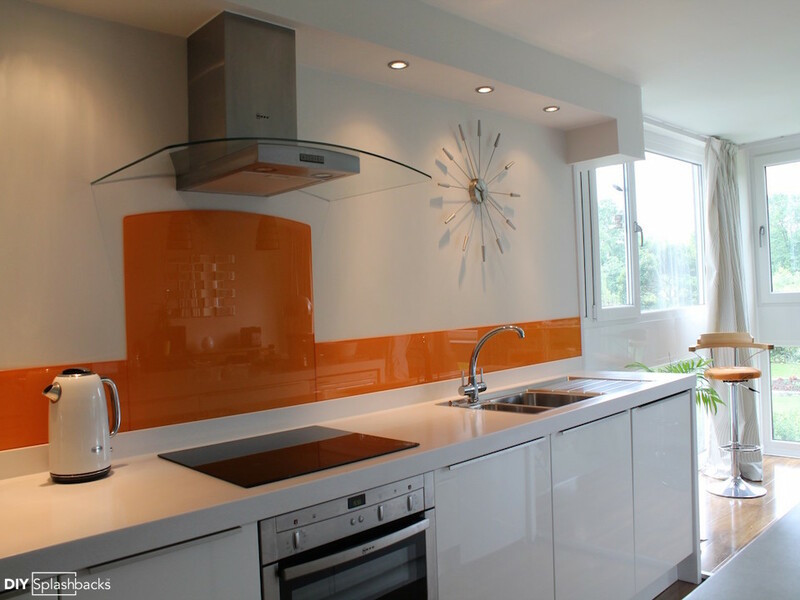 The above glass splashback and matching glass upstands are Dulux Tangerine Twist. Our client had upstands fitted with their worktop, however wanted to add much needed colour to this minimalist scheme. Adding upstands is a cost effective way to protect your walls, and adds visual interest. Glass Upstands start at just £35! Find out more about our Coloured Glass Upstands. The above glass splashback is Dulux Moroccan Flame. This time the splashback is fitted all the way to the cooker hood, with plug cut outs. Achieving this look is not as difficult as you might think. Our comprehensive tutorials section shows how to measure and fit your new glass splashback, as well as measuring for socket cut outs. Visit our tutorials section. Another way to achieve this look is to opt for our Nationwide Glass Splashback Fitting Service. Our experienced fitters take care of everything for you, for less than you might expect, find out more our glass splashbacks fitting service. Note how this client opted for matching glass upstands on their secondary wall, a cost effective way to continue the look. This splashback is fitted in Dulux Earth Glaze 2 in a popular shaker style kitchen. Different from the other splashbacks featured above, this shade works beautifully with the clients wood block worktops and ivory doors. Deeper or bolder shades potentially would not look as effective, as it is important to consider the scheme as a whole. Regardless of what shades you are considering, we always recommend ordering a glass sample. For £10 you’ll receive a 10x10cm glass panel in your chosen colour, a perfect way to see how your chosen colour will look on glass. Glass sink splashbacks are ideal in kitchens and bathrooms as an alternative to tiles. The above glass sink splashback is Dulux Tangerine Twist, our client chose the colour to match the soap dispenser they loved! Glass Sink splashbacks work equally as well in Kitchens if you opt for a cooker splashback, as the most important areas to cover are splash zones.